My daughter LOVES puzzles. For Eid this year, I thought it would be fun to have one that she can first color, and then cut apart and play over and over again as a puzzle. If you have a puzzle-lover as well, you can download below! 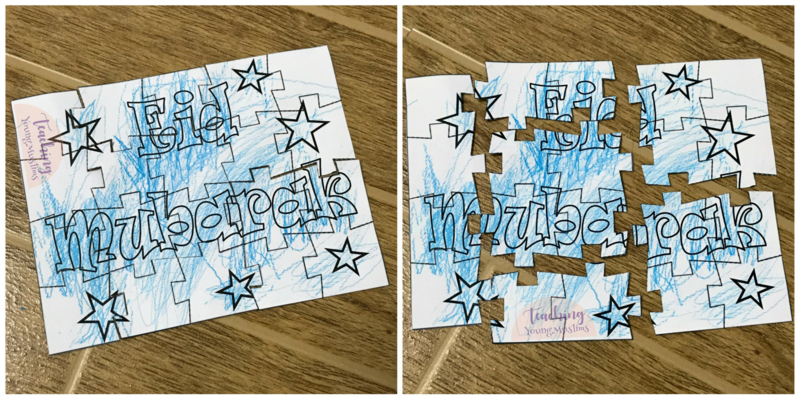 For a more difficult puzzle, you can cut each piece out individually. For an easier puzzle (and an easier cutting job, phew! ), you can cut a few pieces out together, like we did! Go to the Teaching Young Muslims Resource Library to download this puzzle! Enter your name and email address here to receive the password to access these downloads. Previous PostTakbir of EidNext PostHappy Eid!